The younger slugger who has been searching for a role with the Mariners had the big hit in the 4-1 win over the Astros. HOUSTON — In the hours before Monday’s 4-1 victory over the Astros at Minute Maid Park, Mariners manager Scott Servais was discussing the future of Daniel Vogelbach. The young slugger without a position other than designated hitter has proven he can produce at the Triple-A level over the past three seasons. But it’s been different in his short call-ups in Seattle. The minimal playing time and sporadic at-bats have shown a homer here, a walk there and plenty of strikeouts in between. Given Vogelbach’s defensive struggles last spring and the Mariners’ roster setup this season, that opportunity wasn’t available. The Mariners traded for Ryon Healy in the offseason, moving him ahead of Vogelbach on the depth chart. Even now in the final weeks of the season, a hamstring strain has limited him to minimal at-bats since being called up. The sample size of 58 games and 129 MLB plate appearances hasn’t given Seattle a true read of just what or who Vogelbach could be for them. But he’s trying to seize on these minimal opportunities when they’re offered. Called on to pinch hit in the eighth inning with the Mariners trailing 1-0, Vogelbach stepped to the plate with the bases loaded and one-time Astros closer Hector Rondon on the mound. The hard-throwing right-hander tried to overpower Vogelbach with an elevated 98-mph fastball. 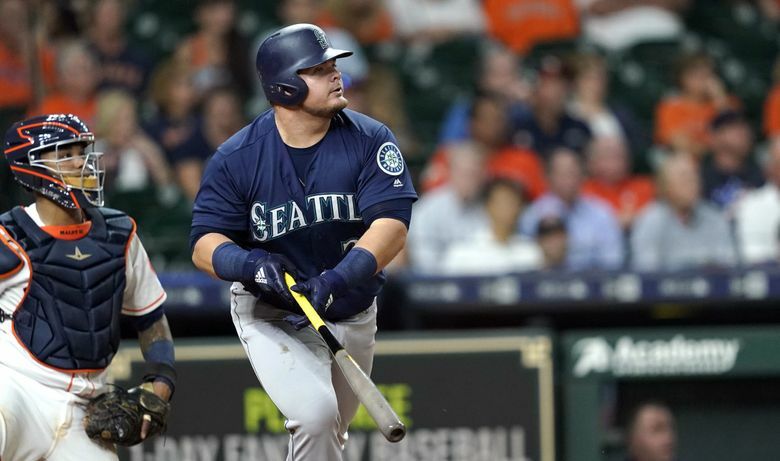 But Vogelbach was ready for it, unleashing his short, powerful swing and producing a rocket into the Astros’ bullpen for his first career MLB grand slam. It was the third pinch-hit grand slam in team history. The other two were: Franklin Gutierrez vs. the Tigers on July 21, 2015 and Ben Broussard at the Angels on April 21, 2007. “Obviously a great at-bat by him and really coming through in a big moment,” Servais said. It was Vogelbach’s fourth homer in 79 at-bats with the Mariners this season. He clubbed a two-run homer on Sunday in Anaheim. When Rondon walked Denard Span to load the bases and bring Vogelbach to the plate, the big right-hander wasn’t going to mess around with offspeed stuff and fall behind. He attacked Vogelbach with three straight fastballs. Vogelbach rarely got to face pitchers who would attack him with fastballs in his at-bats in the Pacific Coast League. He saw a steady diet of offspeed and breaking pitches. Why risk giving him a fastball he could drive? Vogelbach has been humbled enough by big-league pitching in his call-ups to understand it. Could the opportunity that Servais spoke of — 350-400 at-bats in a season — find Vogelbach next season? Well, it all depends on the what the Mariners and the power hitter currently occupying his preferred position do in the coming weeks. Vogelbach may have potential to be a productive big-league hitter, but Nelson Cruz is a proven productive big-league hitter at a level only a handful of players can reach. But Cruz is a free agent after this season and the Mariners have to decide if they want to bring him back on the two-year deal he’ll likely be seeking. Seattle had some thoughts about an extension for Cruz during spring training, but nothing got done. The Mariners have until the end of the season and the beginning of free agency to get an extension done. If Cruz hits the open market, their chances lessen. The team the Mariners beat on Monday — the Astros — could likely have significant interest in Cruz, who would add another big bat to a potent lineup. Can you imagine Cruz playing 81 games in Minute Maid Park with the likes of George Springer, Alex Bregman and Jose Altuve hitting in front of him? If Cruz doesn’t return, Vogelbach would certainly be an affordable candidate for some of those at-bats. The Mariners got a solid start from Wade LeBlanc, who pitched 5 1/3 innings, allowing just one run on three hits with three walks and five strikeouts. But he didn’t figure into the decision with Seattle’s offense being held scoreless for the first seven innings. Seattle’s bullpen kept the Astros lead to just one run. Adam Warren pitched the Mariners out of trouble in the sixth. Ryan Cook and Alex Colome each worked 1-2-3 innings to set up Edwin Diaz, who had an easy 1-2-3 ninth for his 56th save.